Here's another update digest of small tweaks and improvements to Less Annoying CRM! If you want to check out past updates, be sure to check out our Product Update tag on the blog. You can also subscribe to our newsletter if you want updates sent straight to your inbox twice a month. 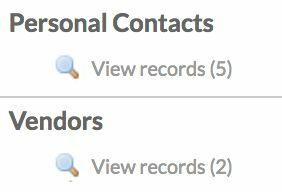 PieSync: integrate your Less Annoying contacts with 80+ apps (like Outlook, ConstantContact, and QuickBooks). My Rep Chat: send texts to your Less Annoying contacts and log conversations in the CRM. Fonreach: make calls to your LACRM contacts, see contact information in your caller ID, automatically log call recordings to the CRM, and more. When you add a new user to your Less Annoying CRM account, they receive an email welcoming them to the account and explaining how to set their password. If newly added users didn't receive this email (because there was a typo in their email address, etc), you used to have to contact Less Annoying CRM for a password reset or re-add the user. Now, if you are an account admin, you can resend the welcome email yourself! Just go to the Manage Users page under Settings, and click "Re-send welcome email" under the user's name. If you do not see this button, it means the user has been able to successfully log in and set a password. If you navigate to the Manage Groups page under Settings, you'll see that the total number of records in each group now displays next to the group name! If you are trying to clean up your groups, seeing the total number of contacts in each group can make it easier to identify duplicates or empty groups that aren't being used. 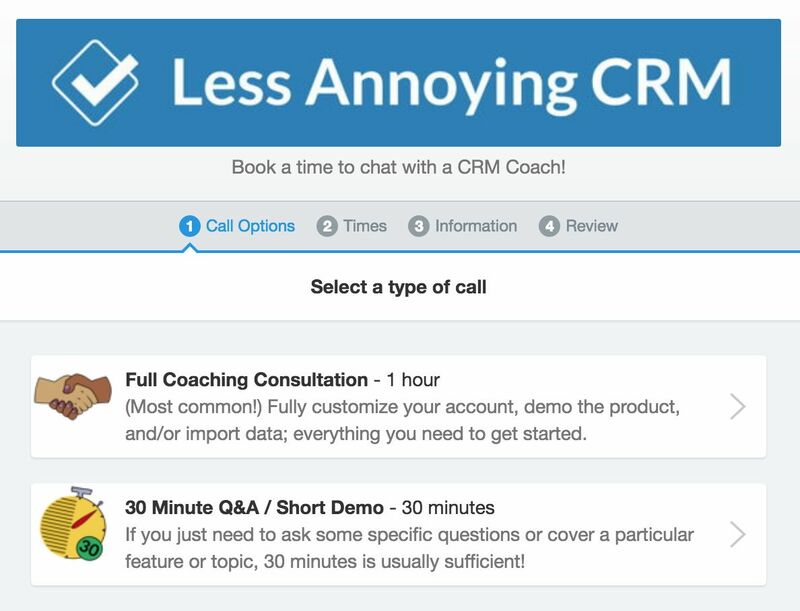 Less Annoying CRM is using a new scheduling system, Appointlet, to help us schedule demos, customizing consultations, and quick Q and A calls. When you contact us to schedule a call, instead of going back and forth about potential times, we'll send you a special scheduling link so that you can see all of our available call slots. You can choose to schedule a full 1-hour consultation for feature deep dives or customizing help, or a 30-minute Q and A if you just have a few questions. This is what our new scheduling tool looks like! You can still calls us or email us any time you like, so don't hesitate to reach out if you have any quick questions!